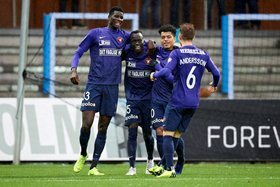 FC Midtjylland have explained that they refused to sell their Nigerian striker Paul Onuachu in the January transfer window because interested clubs were not willing to match their asking price. Turkish giants Galatasaray and Belgian side Racing Genk had made a bid for the lanky forward but the bids were rejected by the Danish champions. ''Paul is still a FCM player, and that's really the most important thing. There must be a real match for everyone if you have to make a sale, but there didn't come a bid that we were happy with,'' says FCM sporting director Graversen to bold.dk. Onauchu had himself expressed the hope of being sold in January, but Graversen does not expect the attacker to have problems with the motivation with a week to the resumption of the Super Liga. ''No not at all. I haven't experienced anything earlier in that direction with Paul, so it's not really a topic. We are facing a very exciting and challenging spring. "Paul is very well-liked in the squad and club, and I'm sure he's going to have a huge impact on us this spring," added Graversen. Paul Onuachu has contract with FCM until the summer of 2020.